Today I have a guest post for you from Siobhan Curham, author of some fantastic books including Finding Cherokee Brown and Dear Dylan. These books were fiction novels aimed at the teen market and really hit the nail on the head when it came to real teen issues. 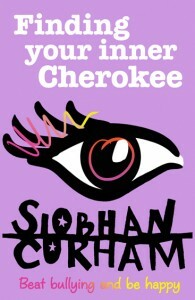 Siobhan’s new book is related closely to Finding Cherokee Brown but is a non-fiction title dealing with the very real issues surrounding bullying. It publishing this week to coincide with National Anti-Bullying Week and Siobhan is my guest today to tell you more! In March of this year, my novel Finding Cherokee Brown was published. Finding Cherokee Brown tells the story of a 15-year-old girl who finds the confidence to stand up to her bullies in her own unique way. After the book was published I received many emails from readers telling me that the book had helped them deal with bullying in their own lives. This made me want to do more to help and so the idea for Finding Your Inner Cherokee was born. Finding Your Inner Cherokee is a non-fiction e-book, full of case studies, exercises and advice, designed to help victims of bullying find their inner strength and become happy again. As a writer (and Official Word Nerd!) I am a firm believer in the power of the written word. Finding Your Inner Cherokee features many different writing exercises, covering all aspects of being bullied. The exercise I want to share here is one I created for people who are being bullied and want to seek help. If you are being bullied and want to tell someone what is happening but are struggling with how to tell them, then this is for you. It’s the end of the school day and the classroom is empty. A teacher sits marking books at her desk. A student (Chloe) approaches. Chloe: Excuse me, Miss, could I have a word? Chloe: I’ve been having a few problems. Chloe: No – with another student. Teacher: How do you mean? Chloe: I’m being bullied, Miss. You’ll notice that Chloe went straight in with the b-word, no messing. I did this deliberately. Teachers are all too aware that bullying is a major problem in schools. They also have a legal duty to keep you safe from harm while you are in their care. Saying that you’re being ‘bullied’ as opposed to ‘picked on’ or ‘teased’ will hopefully trigger an alarm bell in your teacher’s head and cause them to immediately take you seriously. But what if your conversation doesn’t go according to plan? If you’re already feeling nervous about telling someone, the slightest hiccup could make you bail out completely, so you need to be prepared for every eventuality. Try writing the same scene, but this time with it not going quite so smoothly. It’s the end of the school day and the classroom is empty. The teacher sits marking books at her desk. A student (Chloe) approaches. Teacher: Sorry, Chloe, I’m really busy, can it wait till tomorrow? Chloe: Not really, no. I need to tell you now. Teacher: But I’m about to go to a meeting. Teacher: Yes, of – oh . . .
Chloe and her teacher look on in horror as a herd of buffalo stampede the classroom. Okay, so it might not be quite that dramatic, but a fire alarm could go off, or someone else could enter the room, making it impossible to talk right at that moment. If this does happen to you, it’s okay, don’t lose heart. Either choose someone else to speak to or try again at the first possible opportunity. You might also want to write out the entire conversation in script form beforehand rather than just the opening few lines. Obviously, you’re never going to be able to predict exactly what the other person is going to say, but it does give you a great opportunity to get clear on what you are going to say. Write down exactly what you’re going to tell the person – all the details of what’s been happening to you, and how it’s been making you feel. Once you’ve written your script, practise saying your lines out loud. If you get really comfortable saying your part beforehand it will help you feel a whole lot more confident and relaxed when it actually comes to saying it for real.